By most accounts, Charles III of Bourbon, who ruled the Kingdom of Naples from 1734 to 1759, was an "enlightened monarch." He didn't just build opera houses and royal palaces. He set out, for example, to construct the world's largest shelter for the indigent, the mammoth Albergo dei Poveri, a facility —a walled town, virtually— that would house and educate 8,000 of the kingdom's destitute at one time. That project never got finished, not the least reason for which was that Charles abdicated to return to Spain, leaving Naples in the care of his half-wit son, Ferdinand. One project, however that did get finished dealt with the unpleasant task of what to do with the dead who couldn't afford a burial. The nobility and otherwise well-heeled, of course, had private chapels and burial grounds within the city, but what of the poor, the homeless, and the unknown stragglers in the big city who just dropped dead every time there was a minor outbreak of the plague or cholera or even from natural causes? It fit in with Charles' scheme of a "cycle of assistance" for the indigent that a free, modern cemetery for the poor should be built. The design fell to Ferdinando Fuga to fulfill this plan for a new cemetery, a very advanced one for its day in that it was to be well beyond the city walls. After Charles' departure for Spain, Fuga got the approval of the new monarch, Ferdinand IV, in 1762 for the construction of a pauper's cemetery to be built not too distant from the Albergo dei Poveri. The project was based on Fuga's experience in planning the Santo Spirito cemetery in Rome. The plan foresaw a square walled-in space on three sides with a building bounding the fourth side, which would house a chapel, custodian's quarters, a mortuary, and the entrance to the premises. Fuga followed his layout of the courtyard of the Albergo in designing the grounds of the cemetery, even down to the dimensions—80 meters on a side, paved with gray trachyte stone. The project called for the creation of 366 trenches, each mounted by an arch and each trench marked by a day of the year (to include the extra day in a leap year). The first trench would receive those who died on January 1; the second day, January 2, and so on throughout the year, a scheme that gave the cemetery its unusual name. The cemetery marks the first use of the Poggioreale section of Naples—at the time, well outside the city—as the area for municipal cemetery space. The cemetery served from 1762 to 1890; it is estimated that 2.5 million bodies were interred during that time. The register that recorded the burials, however, has been lost. 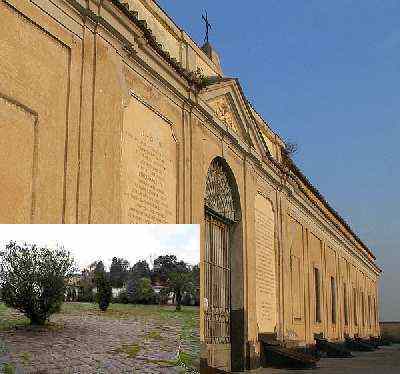 The grounds may be visited, but they are now in poor repair; the premises are in the hands of the arch-fraternity of Santa Maria del Popolo. The entrance is from a small side street that angles off from Corso Malta named via Fontanelle al Trivio, originally marked on old maps simply as, Strada che porta alle Sepolture dette il Camposanto—the "road that leads to the cemetery." 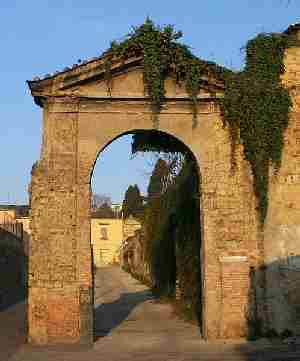 The lower entrance to the grounds is marked by an arch (top photo), and the entrance to the cemetery, itself (photo, right), displays marble plaques attesting to the work of Ferdinando Fuga at the behest of Ferdinand IV. Currently, the central courtyard (photo, right) bears no trace, whatsoever, of the original trenches; it has been planted or paved over. One hears that some sort of "historical restoration" is planned, but that has not yet been undertaken.